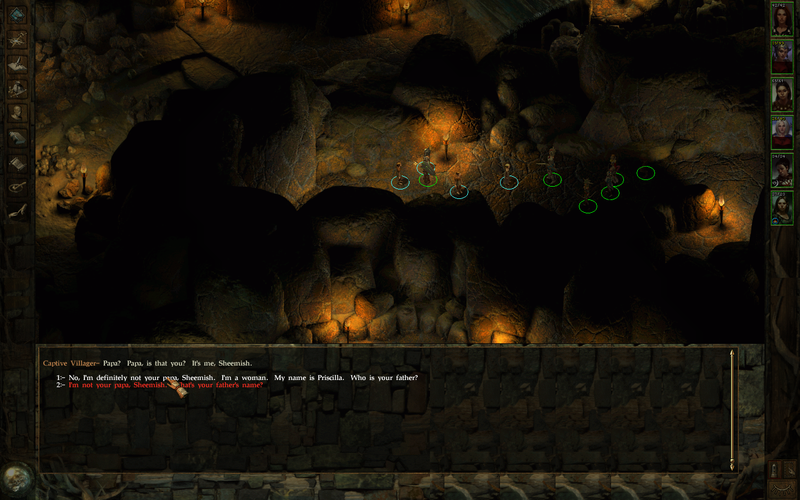 The whole “one dungeon per Icewind Dale report” thing seems to be working just fine for now. This time, it’s the Dragon Eye caverns. I fully expected fire monsters from the get go, but the entrance was infested with ice trolls instead. Luckily, ice trolls don’t seem to have the regeneration ability their warmer-blooded brothers in Baldur’s Gate II had, so I didn’t need acid or fire to kill them. The inside of the cave was more appropriate, with a large group of lizard men that managed to kill Priscilla on my first attempt. The second attempt really emphasized how important magic is. A single cast of Prayer made a world of difference and I won the battle without getting hit at all. Sadly, I was still being careless, so this time I pulled another group and Aleen died. I died a lot, but eventually, I started getting not completely stupid about it, so I managed to explore most of the first level. Mostly, it was infested with lizard men, but there was also an area filled with bombardier bugs and spiders, guarding a magical Broad Sword, which I don’t have the proficiency for. Scratch that! For some reason, I had it in my mind up to this point that broad swords fall into the great sword category. They don’t. They are large swords, so Priscilla is actually extremely proficient with them. The king of lizardmen is, unsurprisingly, a lizard man. There was also a sort of throne room to the north with the king of lizard men. Talking to him resulted in a battle, so I reloaded and decided to explore level 2 first, hoping there would be a peaceful (smarter, better XP-wise) way to deal with him. 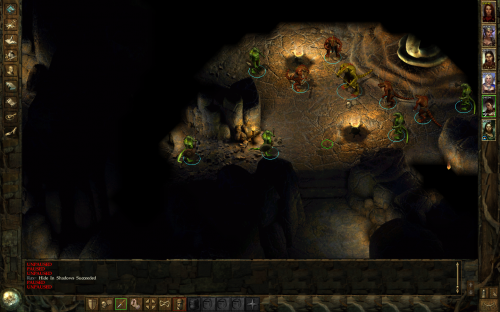 Level 2 was still mostly lizard men and bugs, but now also included regular trolls, which do require acid or fire to completely kill. Luckily, I found a batch of acid and fire arrows in the previous area, so using them sparingly, I was able to defeat the trolls. 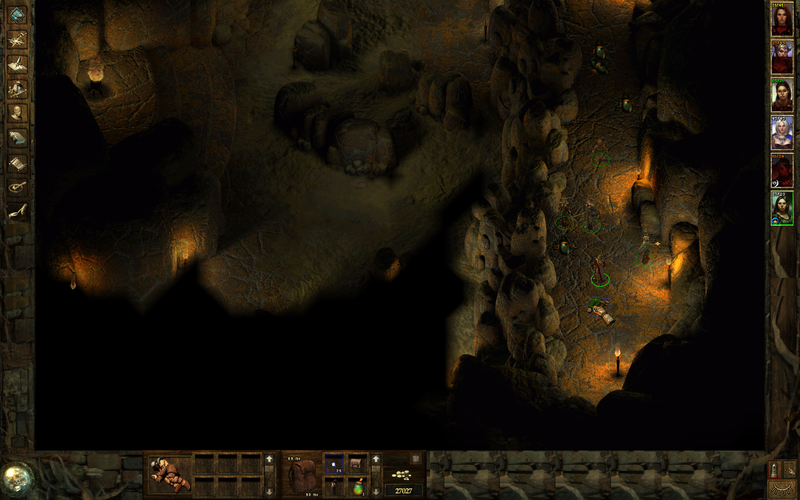 Actually, level 2 of the Dragon’s Eye was closer in atmosphere to those larger Baldur’s Gate dungeons, with several separate features and areas, each holding treasures and rewards. For instance, there was a long hallway to the northeast filled with bombardier beetles. Bombardier beetles aren’t strong, but they do an area attack when they engage, which causes damage to multiple characters and can hold some of them, causing them to take even more damage. The proper approach to deal with these is to lure them in one by one and always expose just one of your guys to the area attack. Doing it that way makes something that’s impossible if you just charge in simply long, but not at all difficult. Two magical weapons for some extermination is a great deal. At the end of the hallway was a reward – a dead body with two magical weapons and a fair amount of gold. Before I collected this reward, I explored the southwestern area with Rax after killing a bunch of trolls. I didn’t engage, though. I spotted a priest of Talos, surrounded with troll followers, holding a priest of Ilmater captive. It was safe to assume that this is the mane objective of Dragon’s Eye. After dealing with bombardier bugs, I spent some time clearing the rest of the insect area of the cave. 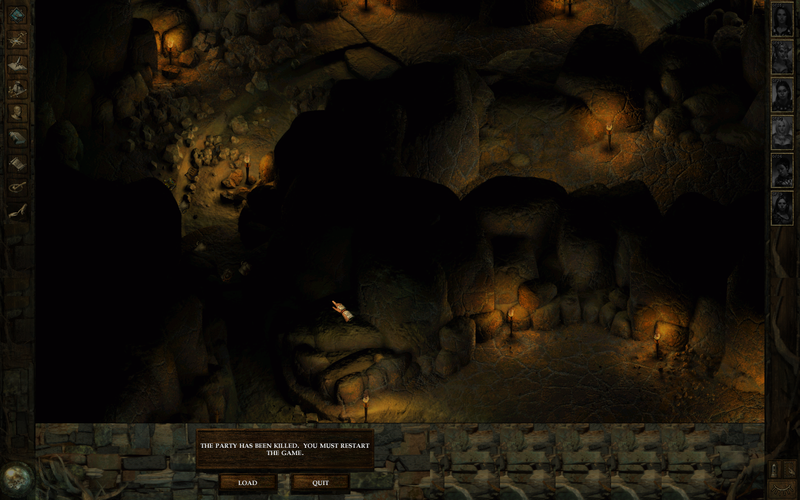 I also found the blacksmith’s son in one of the side caverns, but I had to clear all the lizard men before freeing him. I think I actually just need to clear everything in the previous area. I found the entrance to level 3, and entered it, hoping it would just be a tiny room. It wasn’t. It became obvious that I can’t expect to go back and forth between levels. This was a deep dungeon and I had to clear it one level at a time. On the positive side, I was assaulted by a large group of cold wights at level 3. They are relatively easy to kill, but give 1400 experience each, so it’s a good way to get some levels if I ever have to. I decided to bite the bullet and try to get rid of the lizardmen king. It took me three or four tries, but with Haste, Bless, Prayer and Skull Trap, I managed to get rid of him. The key was to use the hallway before his throne room as a choke point and get rid of the king first, since he hits for most damage. After that, it was jut a matter of healing through the damage and killing his followers one at a time. The king dropped an awesome dagger with a +5 bonus to THAC0 and the snake altar behind him contained a pair of nice boots for Lorelei, as well as scrolls for Fireball and Summon Monster, both of which are extremely useful. Awesome dagger for a rogue. 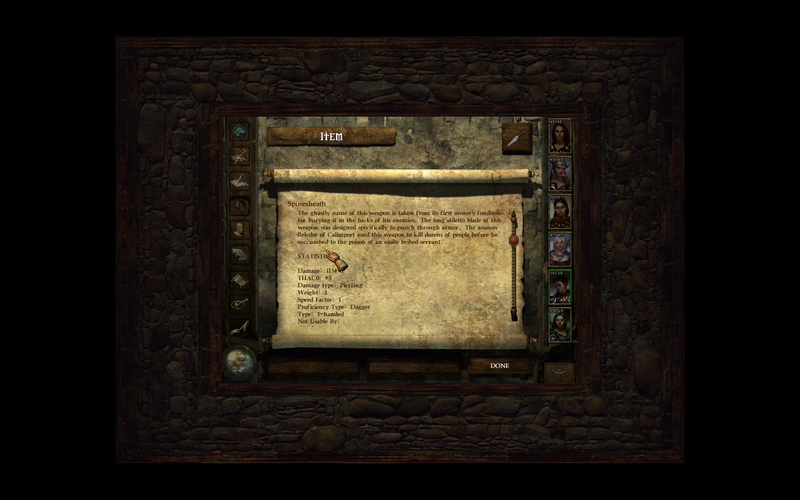 I don’t save cheat more than absolutely necessary in Icewind Dale. This means I will save often, but only reload if I die, not if things don’t go my way. 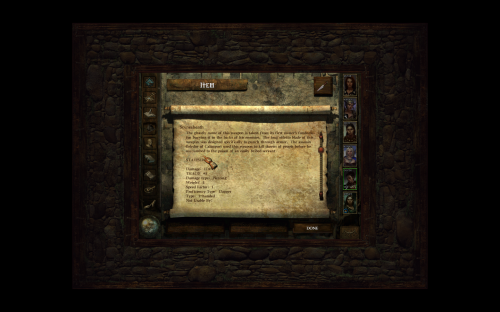 Because of that, I was very worried when I tried to write both scrolls into Aleen’s spellbook, but luckily, it worked with both scrolls, so now I have access to Fireball (and Summon Monster, but Fireball is more important). Now that I’ve dealt with the king, the captured villagers awarded me with 30.000 experience and then I got another 24.000 from the blacksmith’s son. I got cocky, so I thought I’d be able to handle the priests and trolls in level 2. I usually reload before I see this screen (though I would’ve seen it in those cases to). I was wrong. With one spell, they held all three of my fighters and then just mowed through them like they were nothing. I either have to regroup or go to level 3 first. Possibly, it might also be a good idea to go back to Kuldahar and do some shopping. For now, though, this is enough for one report. Previous Previous post: Suikoden  – Getting There?